The Texas Chainsaw Massacre was first released in 1974 (I was four years old at the time - but I didn’t watch it until I was a teenager). To this very day it remains a shocking, confrontational film that takes the viewer into the depths of insanity and violence. 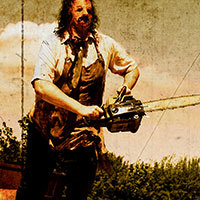 The main villain was Leatherface, so named because he wore the skin of his victims on his face as a mask. Leatherface is part of a family of unemployed abattoir workers who have a history of murder. Their farmhouse is decorated with furniture and bowls made from human remains. His weapon of choice is of course a chainsaw, although he does use hammers, meat cleavers, hooks and other weapons to butcher his victims. There have been numerous sequels and remakes in the Chainsaw franchise but to be honest, only Tobe Hooper’s original is actually any good. When I decided to create a Leatherface shoot, I looked to the original for my inspiration. Of all the films, it is actually the least gory but somehow still the most shocking and disturbing. I decided early on that my shoot would be extremely gory, and I wanted to try and convey an authentic sense of fear and violence in the images. 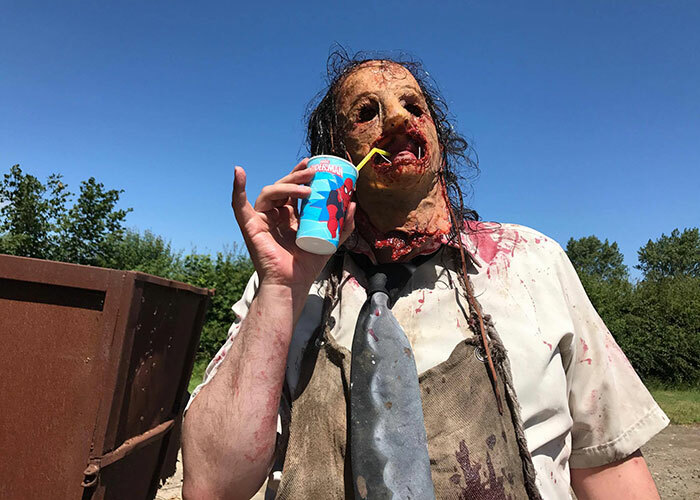 I wanted my Leatherface to be truly menacing and dangerous, so much so that you might actually worry about the victims in the photos. As luck would have it, I managed to find a large and somewhat intimidating guy named Nick to play Leartherface. Not only was he the perfect height and build but he was also a professional scare actor and knew how to frighten people. He was actually a very nice guy in real life but once he was dressed for the part, he was pretty terrifying. I made a filthy apron for him to wear which was covered in grime and smelled really bad, so he wasn’t a pleasant guy to be around. I was also rather pleased to have a real horror luminary on the shoot as a victim. 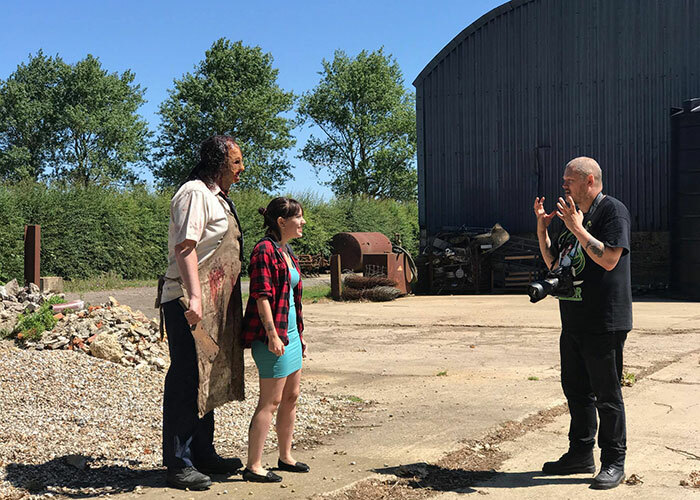 Matt Shaw is a successful author of extreme horror novels and a film maker, and he’s also a huge Leatherface fan, so he was more than happy to come along and be abused by our lofty slasher. I put a very basic narrative into the shoot, which consisted of a number of victims being chased, captured, and killed by Leatherface. The performance of the victims was essential in this shoot. It was down to them to convey the agony and the fear that was necessary to make the photos look authentic, and with some coaxing and (hopefully) good directing I think we achieved some amazing results. I instructed Nick to be brutal with the victims - he was allowed to manhandle them, grab them, carry them off, stand on their faces, and just generally bully them during shots. Some of the resulting shots are pretty disturbing and portray a rather grim vision of violence and death. I didn’t want these photos to look like a fun day of shooting but a stark and truly horrific portrait of murder and madness. My workshop is on a farm in Lydden (Kent) and luckily the farm provided a great location for outdoor shots with rusty old trailers and sheds to shoot against. It was extremely handy having these facilities right on my doorstep. Inside my workshop I set up two shooting areas, one of which was a dark grey grunge backdrop that I made by dragging large sheets through mud and fake blood, and the other was a proper set where Leatherface could lay his victims on a table and butcher them relentlessly. This was his “kitchen” area and was dressed with bones, chains, skulls, and assorted weapons. The mess this area made of my workshop was incredible! I had the worst cleaning job in the world once the shoot was over. The chainsaw was real and heavy, yet Nick wielded it around like a lunatic. All the meat hooks, knives and cleavers we used were real. 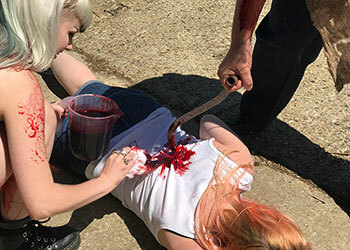 Obviously some good safety measures were in place and the chances of injury were virtually zero but having real props made a massive difference to the look of the images. The most challenging parts of the shoot were the final setpieces in which Leatherface butchered his victims. I had a girl’s throat slashed, another girl beheaded, a guy with his arm chopped off and an open-skull “brain scooping” crafted by artist Rebekah India. To finish the shoot I got all four victims to strip to their underwear and pile up on the floor covered in blood at the feet of their nemesis. I did two edits to really pay homage to the 1974 classic, one of which shows Leatherface running with his chainsaw in an old, scratchy 1970’s image which appears brown and burned, and the other an old black and white newspaper photo. I really tried to invoke a sense of the original film through these images. Despite how horrible the photos are, I can assure you that everyone had great fun on the day and nobody was hurt or killed as far as I can recall. 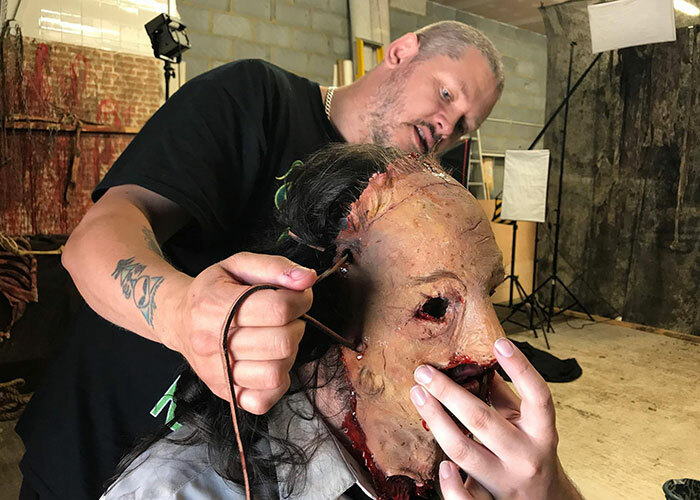 Leatherface mask, set building, makeup and special effects, directing, lighting, photography, editing. 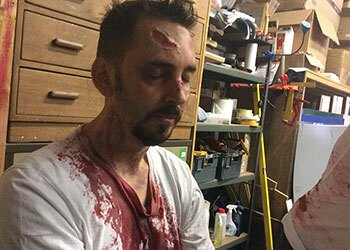 Additional makeup and special effects, head wound prosthetic, victim model.